Can I Handle Another Level Of God Fire Tonkotsu's Spiciness? I like spicy foods which explains why I eat Iranian, Indian and Korean dishes. 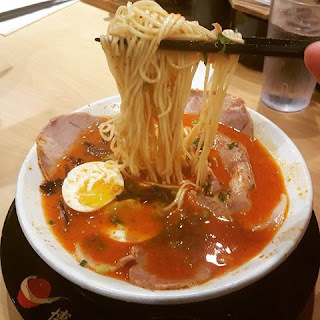 I can't really forget about how my buttocks felt like it "caught on fire" after taking another level of God Fire Tonkotsu to a whole new level of spiciness. I had level one spiciness and I decided to try level two to check my tolerance out. I wasn't able to tolerate the new level of spiciness immediately. I had to slowly drink it and I drank lots of water as a result. Worse, having some phlegm stuck on my throat didn't make things better. The result was that much of my stuck up phlegm got out. Fortunately, I was finished eating before I actually spewed all that annoying phlegm giving me quite a relief. Talk about a delicious remedy! For now, I think I won't get another level of spiciness. I think my tolerance to spicy food has lowered considering I haven't eaten much spicy food as of late. But again, who knows when I can reach another level or maybe I can't considering that some spicy foods are just too much.